Jean Garrett Ramsey, 75, of Huntington, WV, passed away Sunday April 7, 2019 at St. Mary’s Medical Center, Huntington, WV. She was born August 23, 1943 in Huntington, WV daughter of the late Roxie and Wilburn C. Garrett. Her brother John Garrett also preceded her in death. She is survived by her husband of 57 years, C. Scott Ramsey and her children, Julie Sluss (husband Jim and grandson Tyler), Mary Ramsey (partner Holly Fryman and her son Dylan Fryman-Link), Scotty Ramsey (wife Laura); and her sister Joyce Edwards. Jean was a loving mother, wife and grandmother. She was a longtime member of Johnson Memorial United Methodist Church where she co-hosted “Young at Heart”. 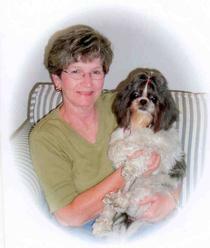 She was a dedicated volunteer with Hospice of Huntington where she shared her creative talents by initiating a prayer shawl ministry and provided comfort to many people with her cherished canine companion, Suzie, the first certified Hospice therapy dog in the Tri-State Area. Her gardening skills have been appreciated for many years with the planting and cultivation of beautiful flowers for her church gardens. She was also a caterer with her business “Two for Tea.” There are simply no words to express the impact this magnificent woman had on so many of our lives. We have been so blessed to have received her love. Jean loved her flowers but requested that you help continue her passions through memorial donations to Hospice of Huntington 1101 6th Avenue Huntington, WV 25701 or Huntington Cabell Wayne Animal Shelter 1901 James River Road Huntington, WV 25701. A memorial service will be held 12 Noon Thursday April 11, 2019 at Johnson Memorial United Methodist Church, Huntington, WV. Visitation will be held from 10:30 a.m. to 12 Noon Thursday April 11, 2019 at the church. Hall Funeral Home and Crematory, Proctorville, Ohio is in charge of arrangements. Condolences may be expressed to the family at www.ehallfuneralhome.com. Sincere sympathy and prayers from me, Sally, and our Staff. She will be missed greatly.